It can occasionally seem impossible to balance a social life, studies, and even eating at times. As of starting school last fall, I’ve had to think of different ways to stay concentrated and on top of all of my assignments and activities. That frequently meant cutting out some of the things I used to or wanted to do. There have been more times than not that I've had to say "no" to people to stay on track. But sometimes, saying "no" can be just as exhausting as saying "yes". 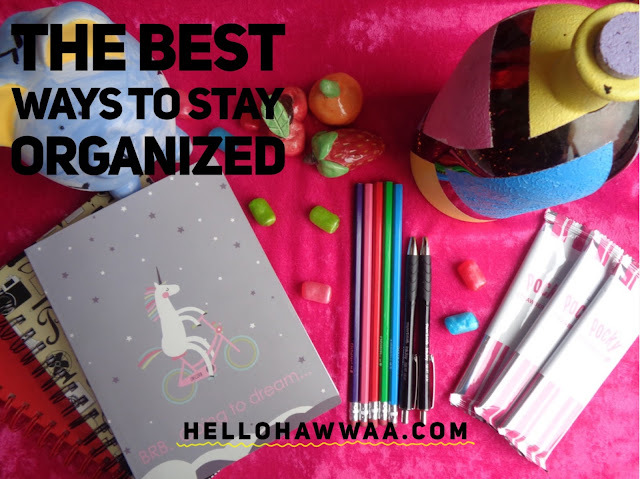 So, I'm coming to you with a few tips and tricks in order for you to stay organized for here in the present and future. I've tried countless ways to stay organized and have been experimenting with a couple of options and as I've done so, I've now realized that there isn't just one rooted way to stay on top of things. I find that I have to do various forms of organization to stay on track and doing everything together has to lead to a more unified life. Now, keep in mind, these ways are what I have found to work me out. I'm known to be an obsessive person so if you happen to be as well, doing a majority of these acts at once may help you out. However, everyone has numerous ways when it comes to staying on track, but if you just haven't found a successful way, why not give one or two (or all) of these a try! I used to keep a planner while I was in high school. My high school used to give them out for free at the beginning of every school year and as I took advanced and AP classes, I found that receiving homework every day was inevitable. Writing down everything that was assigned on that specific day and formulating an order of completion seemed to work wonders for me. Since starting University in the first semester and at the beginning of the second semester, I decided not to keep one. I didn't exactly know why. Perhaps I thought that being a mature adult meant that I didn't need one anymore, but oh was I wronged. So, in the second half of my second semester, I realized that I needed one immediately. What also helps when it comes to keeping a planner is crossing out every completed task. There's just something about your list of duties becoming less and less as the days go by. Of course, only to have more added to it at the beginning of each week. In addition to keeping a planner, writing tasks on sticky-notes and placing them about your workspace can give you that extra expansion of remembering what you need to do. I personally love sticking them on the top of the desk in my dorm or on the wall because if I'm working on something and finally look up after four hours, what I need to do next is right in front of me. Once it's completed, cross it out! Oftentimes, I write my to-do lists on "Google Sheets" since I'm already wasting so much paper with my sticky-notes and planner, but it can truly be done anywhere. Even on a Starbucks napkin. Writing out a to-do list for the day or the week can really set the precedent for your whole life. I personally write two sections of a to-do list: one side of the list is for anything having to do with school, and the other side is for personal life. Having color-coded pens or highlighters adds to the list and makes it more appealing. I find that when things are colorful and fun, I get motivated to do it. If you're using "Google Sheets", highlighting the completed task in green and the approaching ones in red can help with time management. It's extremely simple to make an original calendar and spice it up with customized decorations, but if you just don't have the time, I bought my washable/reusable calendar from Wal-Mart for about $8. As you change it every month, write down any events or tasks you have to do that month and continue adding once something comes up. If events aren't your thing, do the same for any tests or projects you'll have due that month. Once the day is over, cross it out and get prepared for the next day. Color coding with different colored whiteboard markers works as well. Some people tell me that this is a bit extreme, but I personally like to set reminders on my phone of when things are due. Exactly a day before it needs to be done, my phone sends me a notice. This is usually done in the calendar app on iPhones or Androids. Another thing I do, especially on school days, is set alarms for ten minutes before class and for the amount of time I'm going to spend on each set of homework. I usually do this so that I don't get indulged into one thing for too long. I also have an alarm that goes off every morning and evening so I know when to wake up and especially when to go to bed. You can take my tips and run with them or you can find some good organizational tools that are going to work best for you. If you have any fool-proof ways to stay organized, please don't hesitate to inform me and benediction to those who are looking for a change in their life! We'll be in touch.